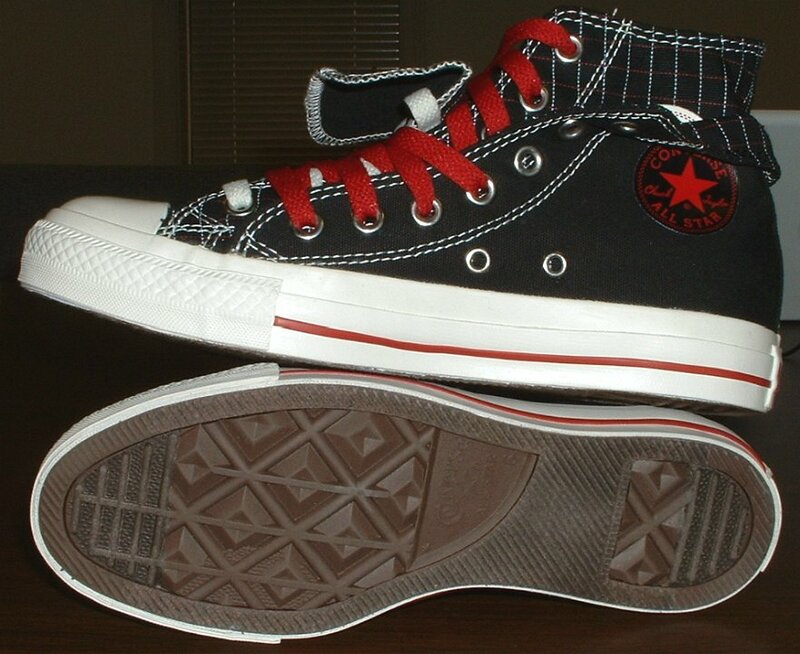 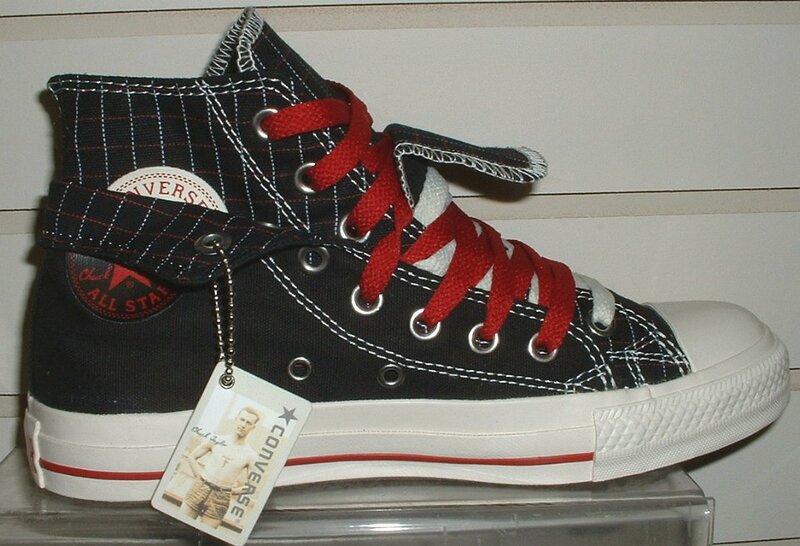 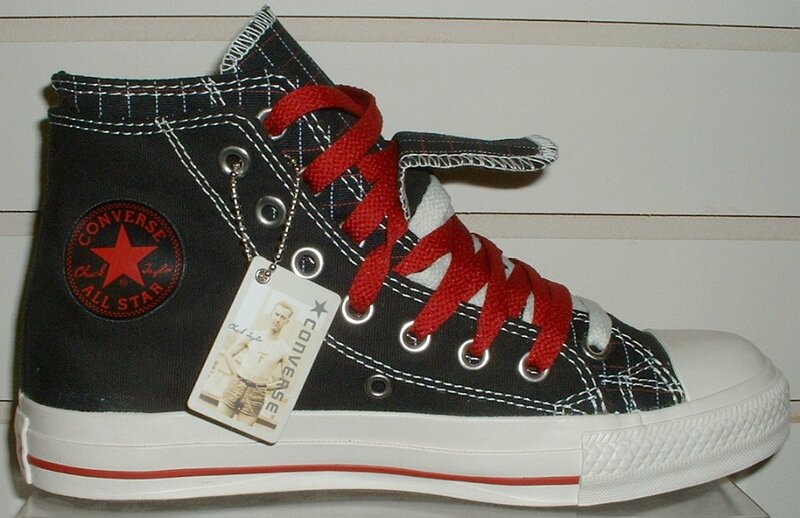 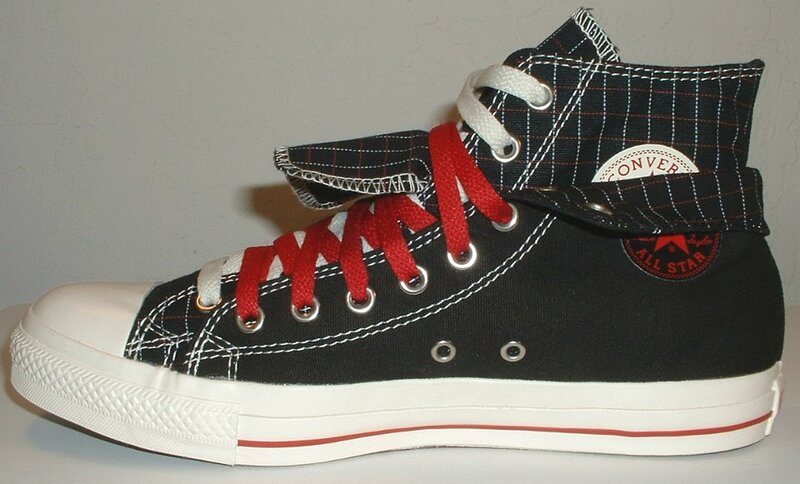 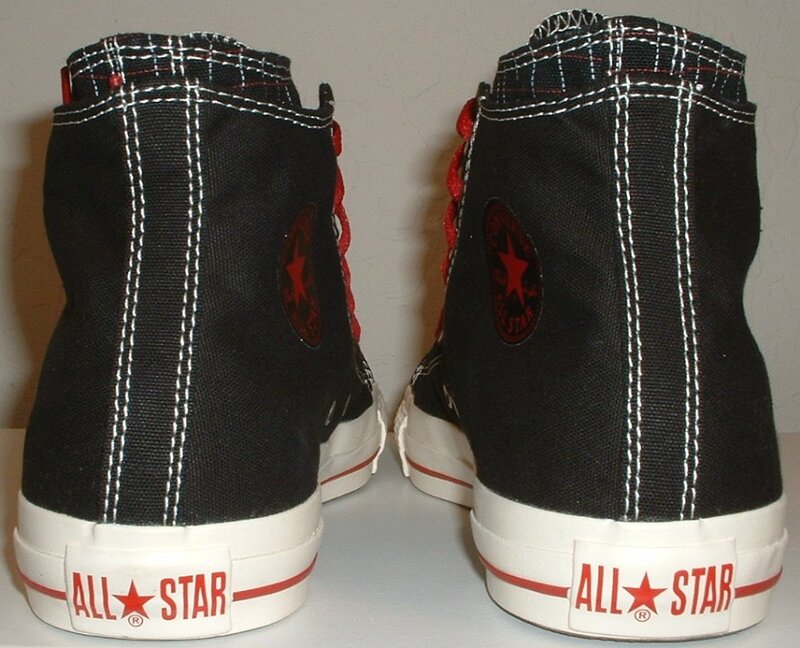 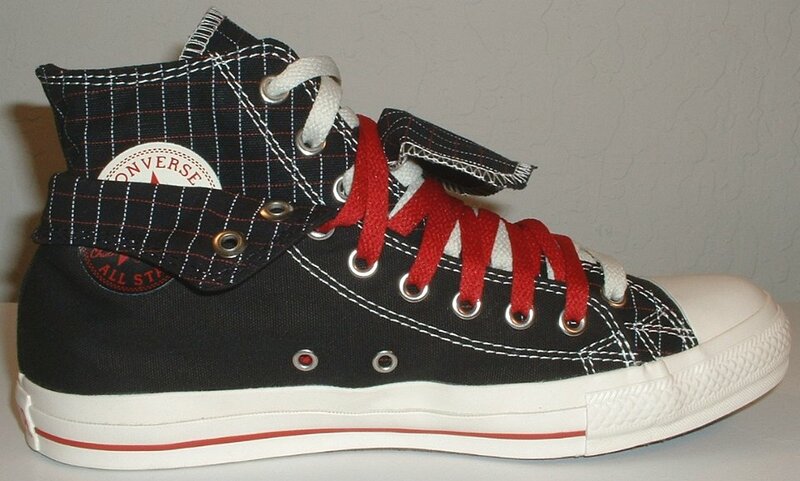 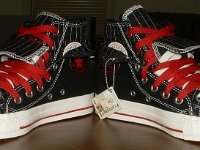 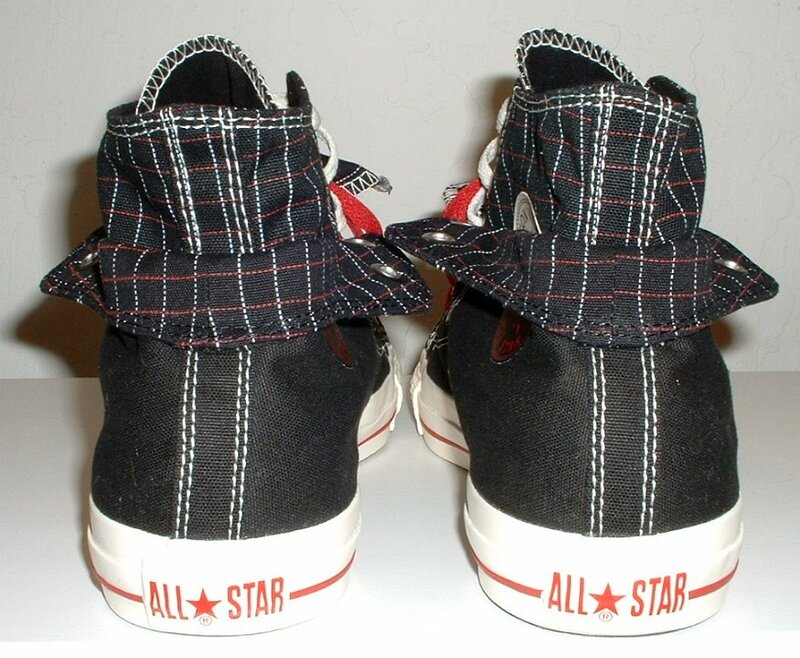 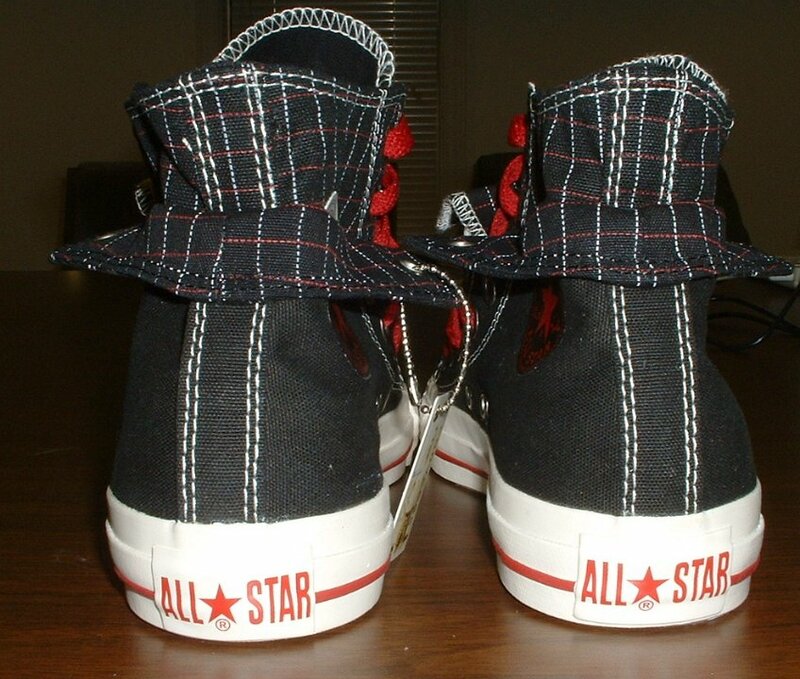 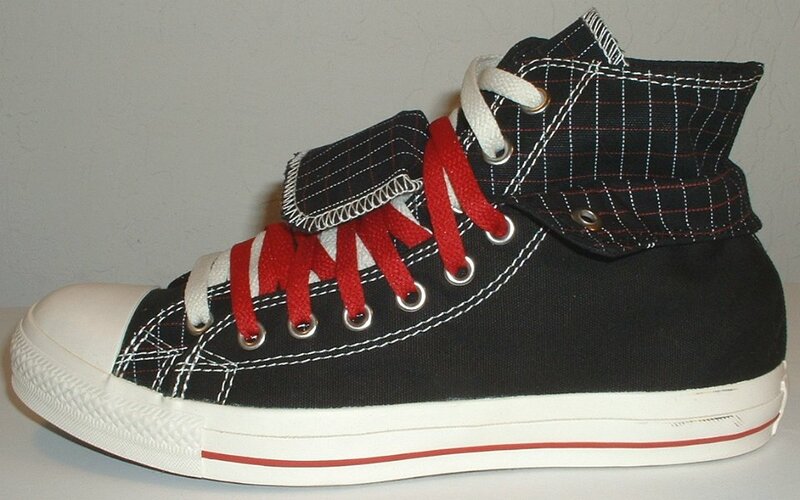 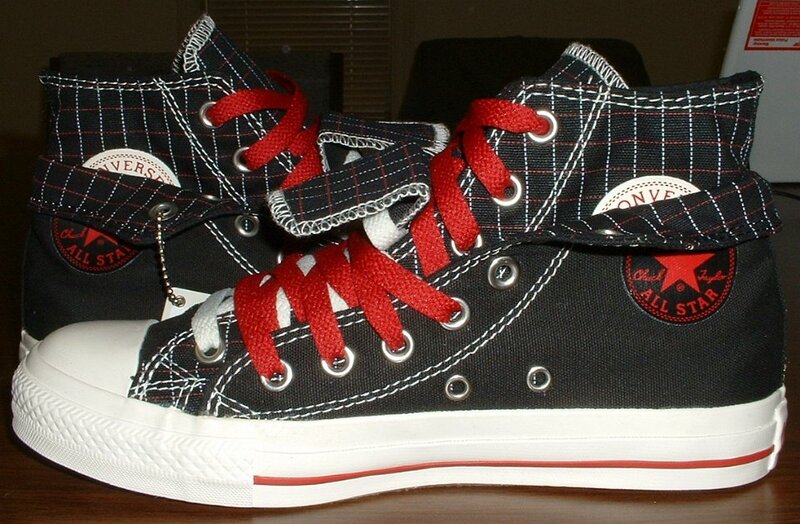 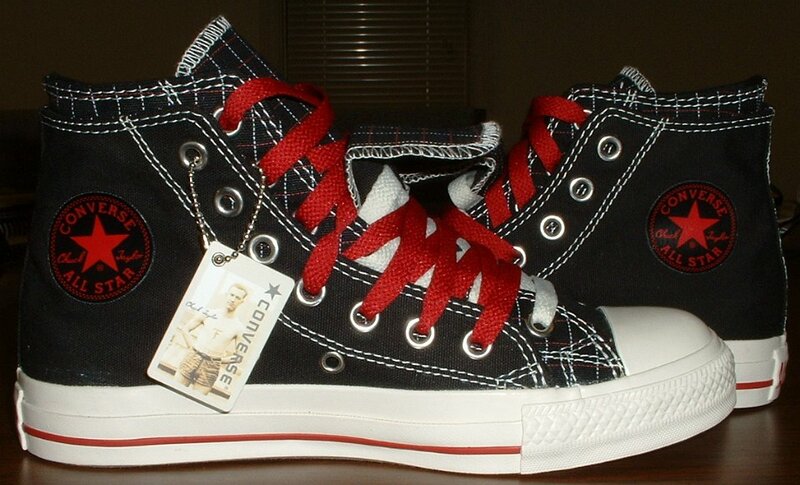 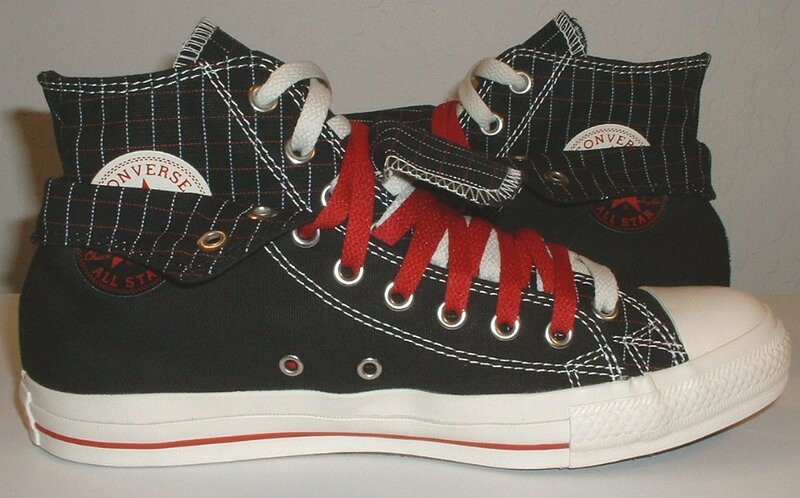 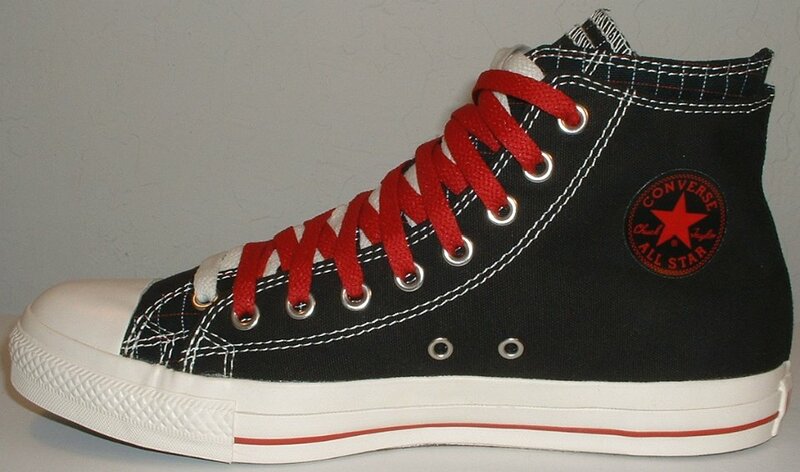 Photo gallery of black and red pinstripe double upper high top chucks. 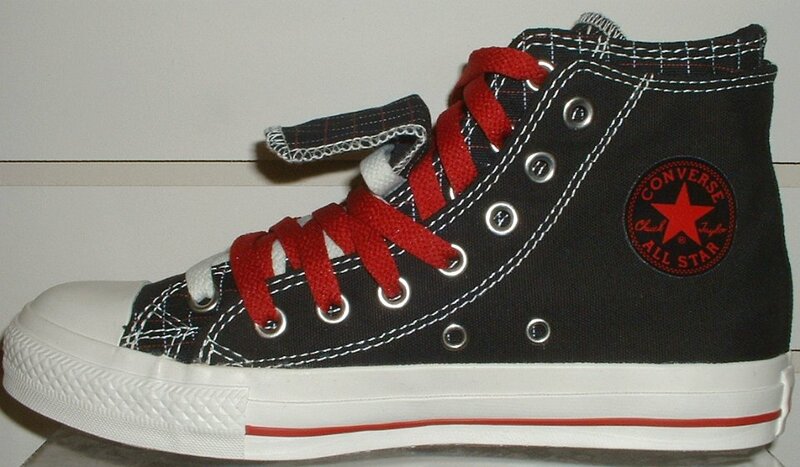 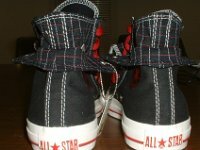 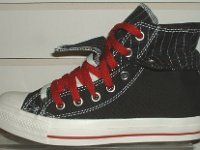 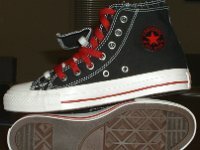 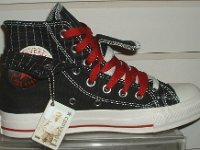 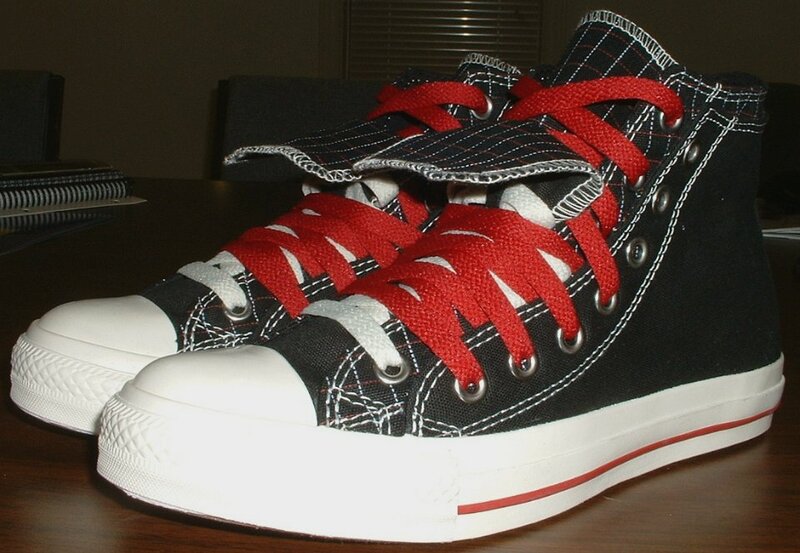 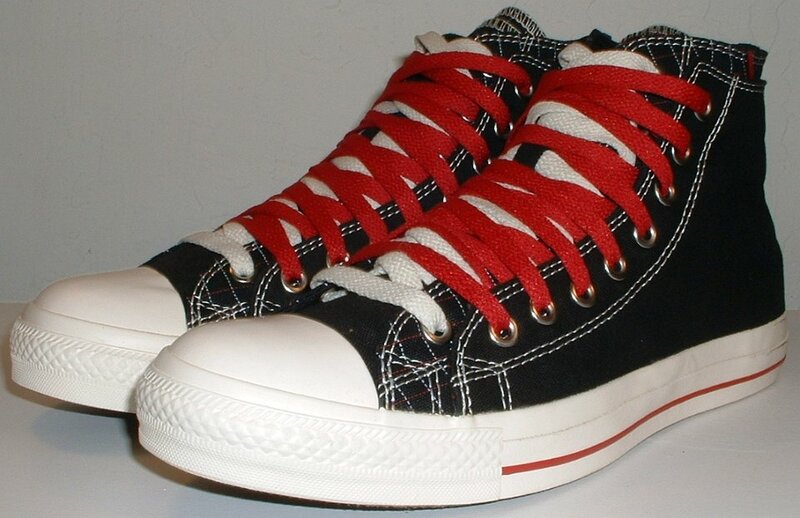 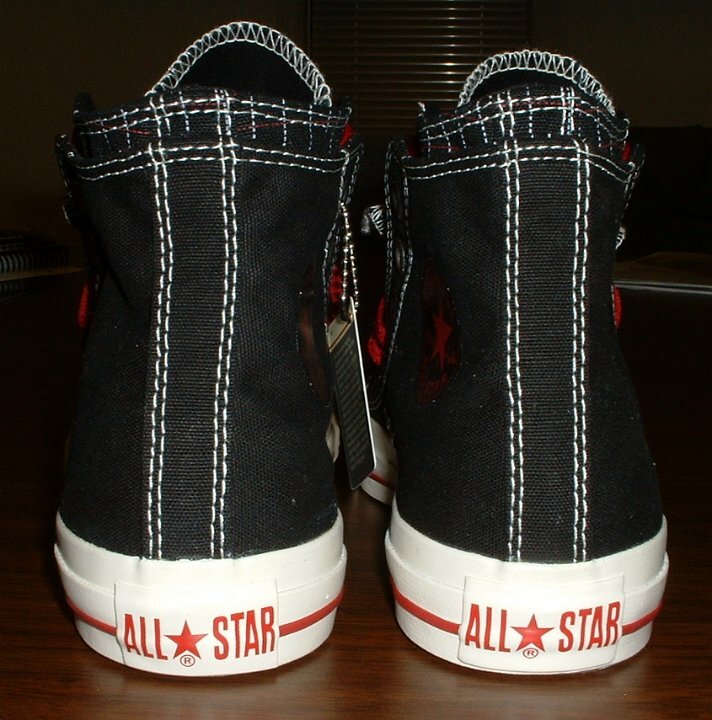 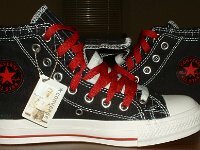 1 Black and Red Pinstripe Double Upper High Top Chucks Outside view of a right black, red, and white double upper high top, with the outer upper rolled down. 2 Black and Red Pinstripe Double Upper High Top Chucks Inside patch view of a right black, milk, and red double upper high top, with the outer upper rolled down. 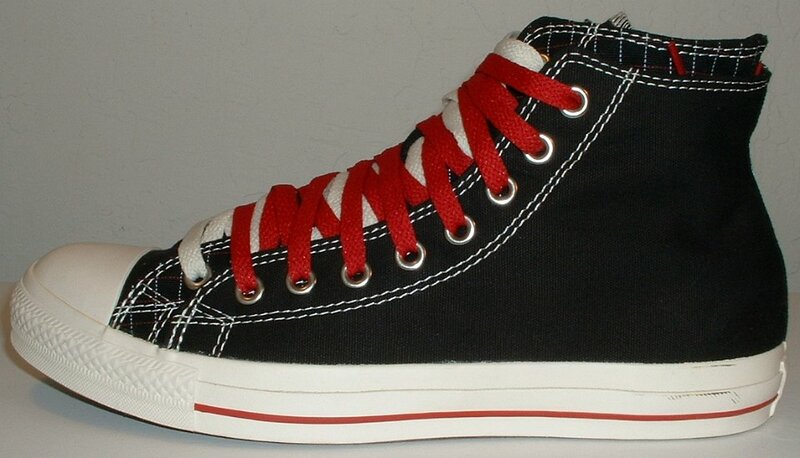 3 Black and Red Pinstripe Double Upper High Top Chucks Inside patch view of a right black, red, and milk double upper high top. 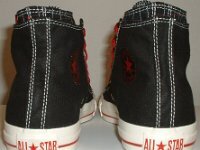 4 Black and Red Pinstripe Double Upper High Top Chucks Inside patch view of a right black, red, and milk double upper high top. 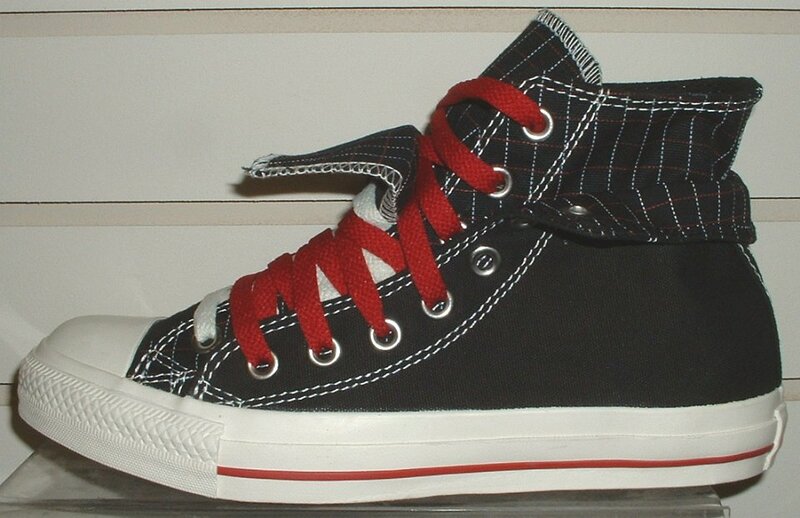 5 Black and Red Pinstripe Double Upper High Top Chucks Inside patch view of a right black, red, and milk double upper high top, with the outer upper rolled down. 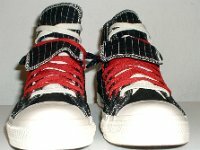 6 Black and Red Pinstripe Double Upper High Top Chucks Outside view of a right black, red, and white double upper high top. 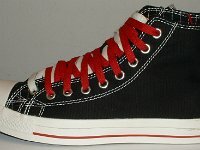 7 Black and Red Pinstripe Double Upper High Top Chucks Outside view of a right black, red, and white double upper high top, with the outer upper rolled down. 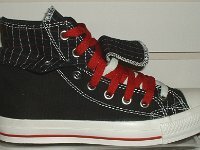 8 Black and Red Pinstripe Double Upper High Top Chucks Outside view of a left black, red, and white double upper high top, with the outer upper rolled down. 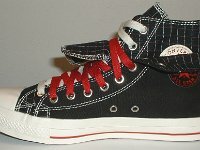 9 Black and Red Pinstripe Double Upper High Top Chucks Outside view of a left black, red, and white double upper high top. 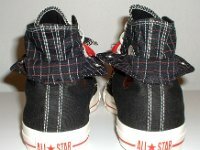 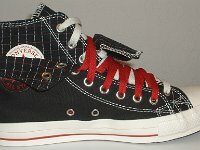 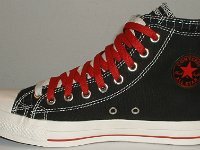 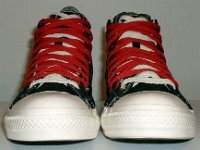 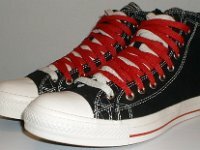 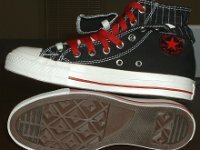 10 Black and Red Pinstripe Double Upper High Top Chucks Outside view of a left black, red, and white double upper high top, with the outer upper rolled down. 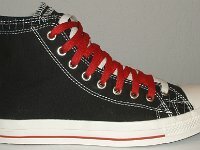 11 Black and Red Pinstripe Double Upper High Top Chucks Inside patch view of a left black, red, and milk double upper high top, with the outer upper rolled down. 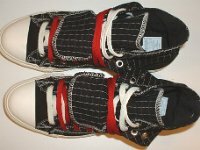 12 Black and Red Pinstripe Double Upper High Top Chucks Inside patch view of a left black, red, and milk double upper high top, new with tag. 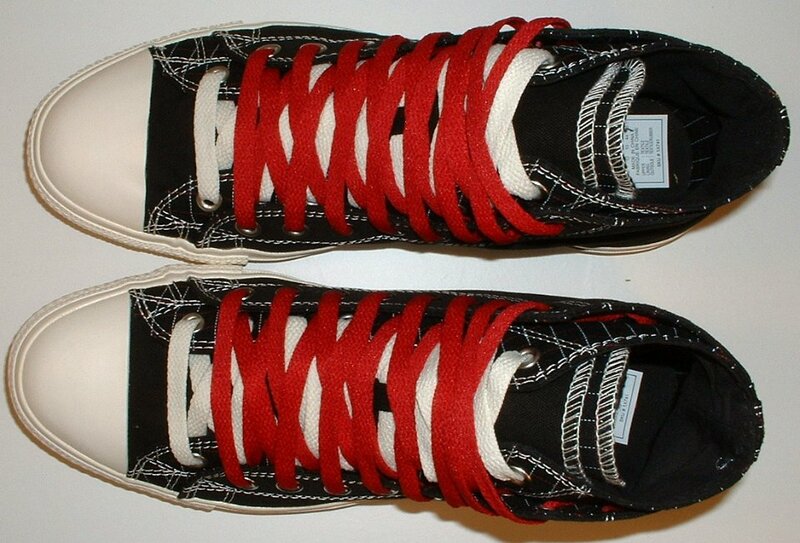 13 Black and Red Pinstripe Double Upper High Top Chucks Inside patch view of a left black, red, and milk double upper high top. 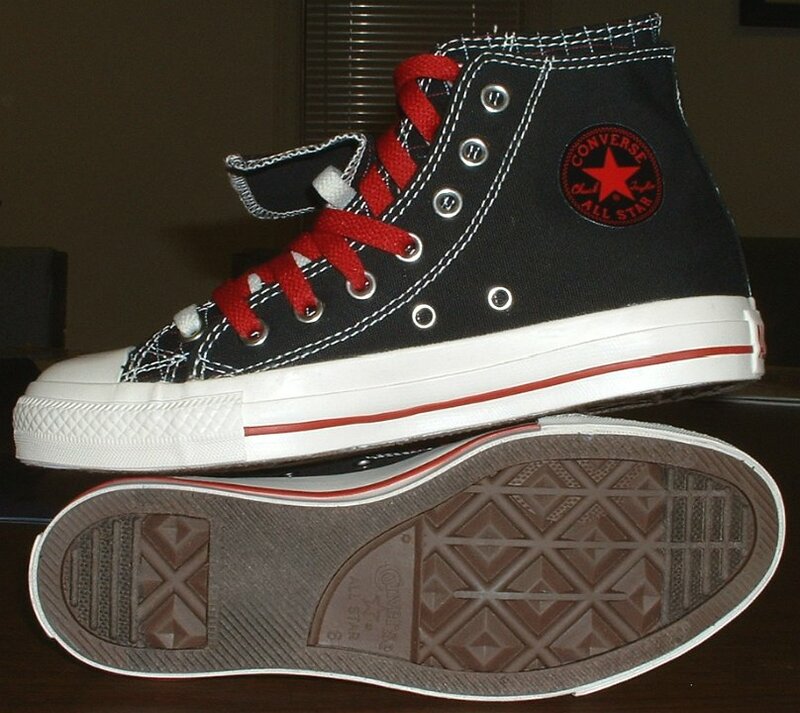 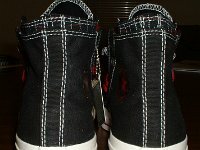 14 Black and Red Pinstripe Double Upper High Top Chucks Inside patch view of a left black, red, and milk double upper high top, with the outer upper rolled down. 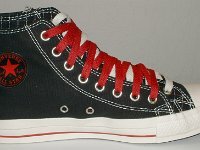 15 Black and Red Pinstripe Double Upper High Top Chucks Rear view of black, red, and milk double upper high tops, with the outer upper rolled down. 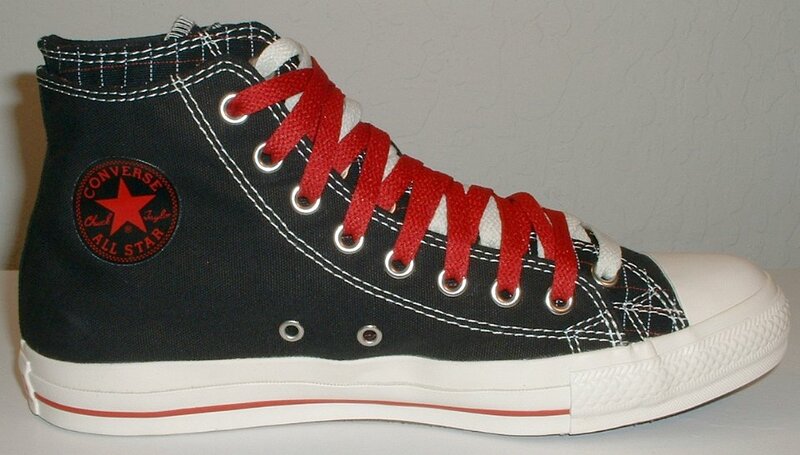 16 Black and Red Pinstripe Double Upper High Top Chucks Rear view of black, red, and milk double upper high tops. 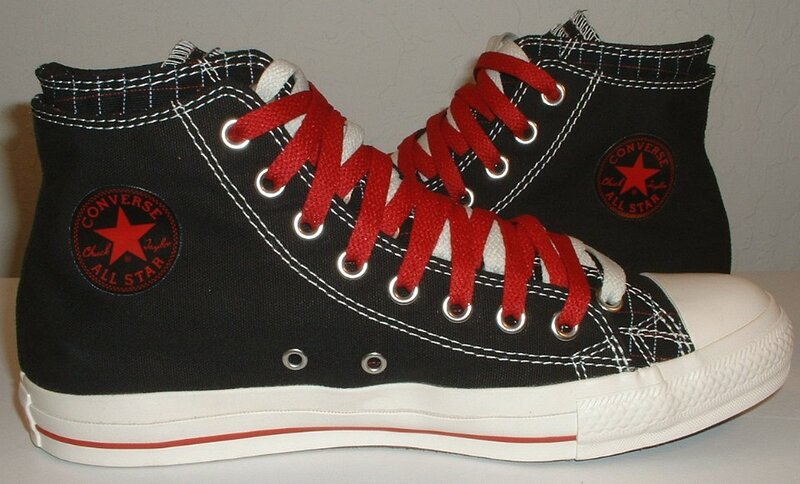 17 Black and Red Pinstripe Double Upper High Top Chucks Rear view of black, red, and milk double upper high tops. 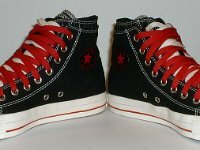 18 Black and Red Pinstripe Double Upper High Top Chucks Rear view of black, red, and milk double upper high tops, with the outer upper rolled down. 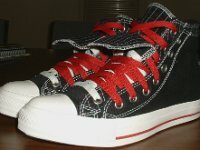 19 Black and Red Pinstripe Double Upper High Top Chucks Front view of black, red, and milk double upper high tops. 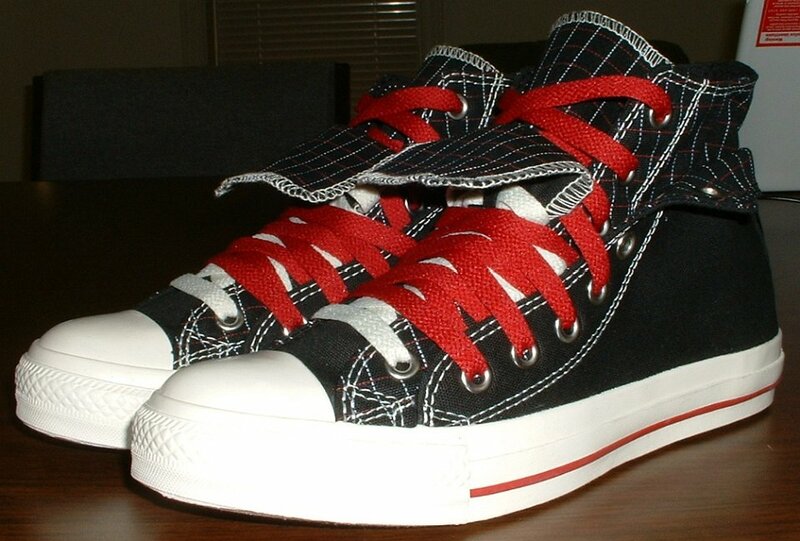 20 Black and Red Pinstripe Double Upper High Top Chucks Front view of black, red, and milk double upper high tops, with the outer upper rolled down. 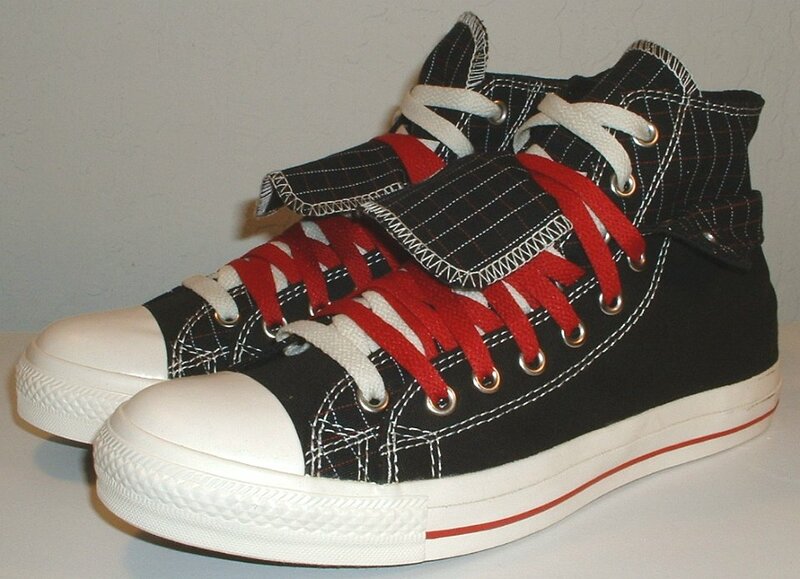 21 Black and Red Pinstripe Double Upper High Top Chucks Angled side view of black, red, and milk double upper high tops, with the outer upper rolled down. 22 Black and Red Pinstripe Double Upper High Top Chucks Angled side view of black, red, and milk double upper high tops. 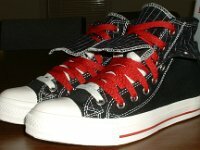 23 Black and Red Pinstripe Double Upper High Top Chucks Angled side view of black, red, and milk double upper high tops. 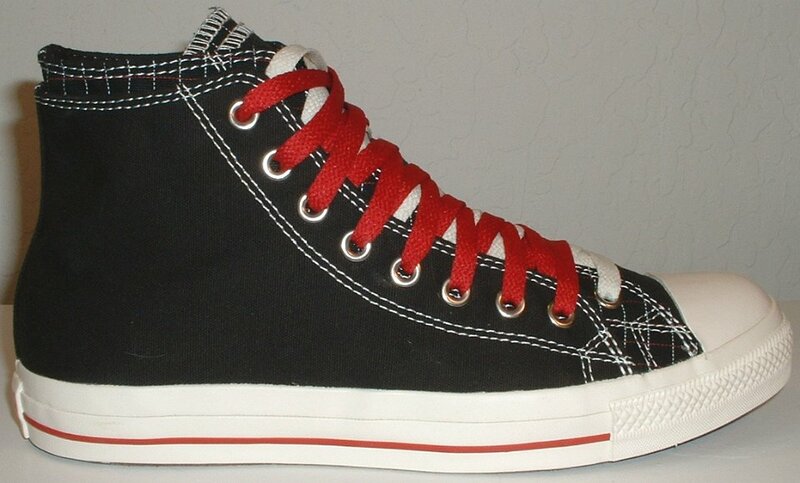 24 Black and Red Pinstripe Double Upper High Top Chucks Angled side view of black, red, and milk double upper high tops, with the outer upper rolled down. 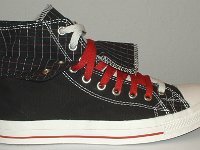 25 Black and Red Pinstripe Double Upper High Top Chucks Top view of black, red, and milk double upper high tops, with the outer upper rolled down. 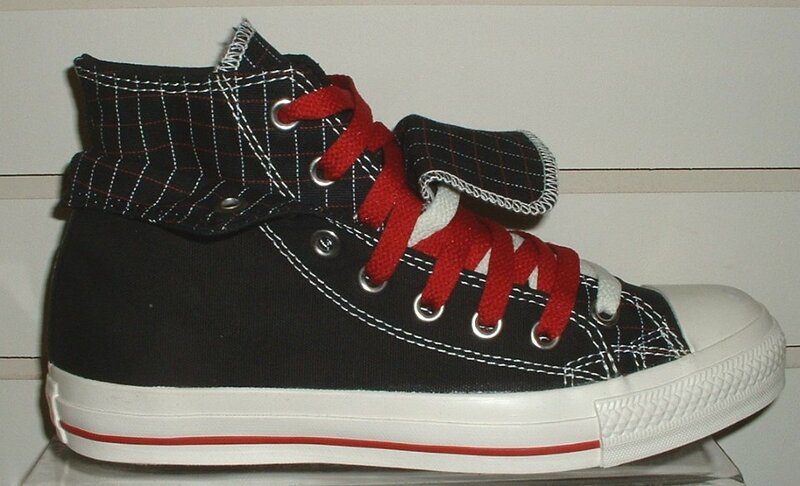 26 Black and Red Pinstripe Double Upper High Top Chucks Top view of black, red, and milk double upper high tops, with the outer upper rolled down. 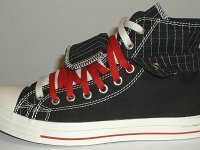 27 Black and Red Pinstripe Double Upper High Top Chucks Top view of black, red, and milk double upper high tops. 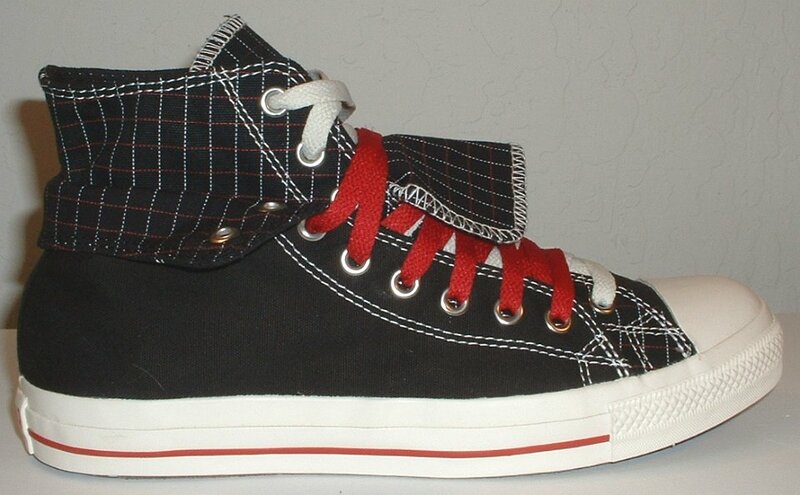 28 Black and Red Pinstripe Double Upper High Top Chucks Inside patch views of black, red, and milk double upper high tops, with the outer uppers rolled down. 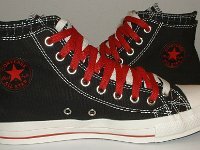 29 Black and Red Pinstripe Double Upper High Top Chucks Inside patch views of black, red, and milk double upper high tops. 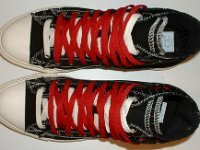 30 Black and Red Pinstripe Double Upper High Top Chucks Inside patch views of black, red, and milk double upper high tops. 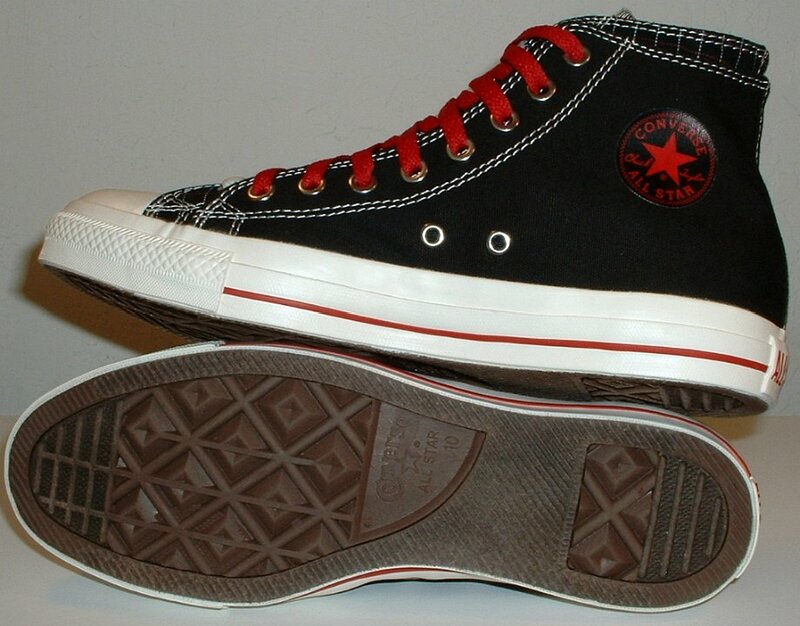 31 Black and Red Pinstripe Double Upper High Top Chucks Inside patch views of black, red, and milk double upper high tops, with the outer uppers rolled down. 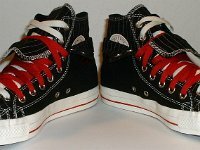 32 Black and Red Pinstripe Double Upper High Top Chucks Angled front views of black, red, and milk double upper high tops, with the outer uppers rolled down. 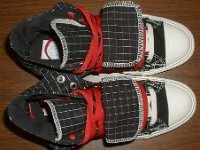 33 Black and Red Pinstripe Double Upper High Top Chucks Angled front views of black, red, and milk double upper high tops. 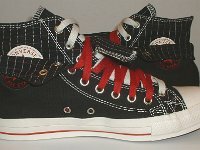 34 Black and Red Pinstripe Double Upper High Top Chucks Angled front views of black, red, and milk double upper high tops, with the outer uppers rolled down. 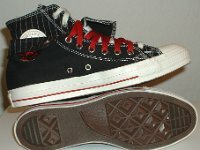 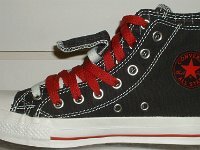 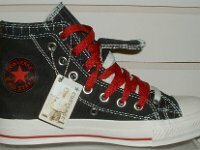 35 Black and Red Pinstripe Double Upper High Top Chucks Inside patch and sole views of black, red, and milk double upper high tops, with the outer uppers rolled down. 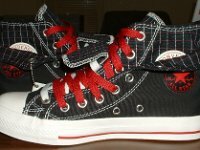 36 Black and Red Pinstripe Double Upper High Top Chucks Inside patch and sole views of black, red, and milk double upper high tops. 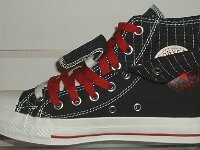 37 Black and Red Pinstripe Double Upper High Top Chucks Inside patch and sole views of black, red, and milk double upper high tops. 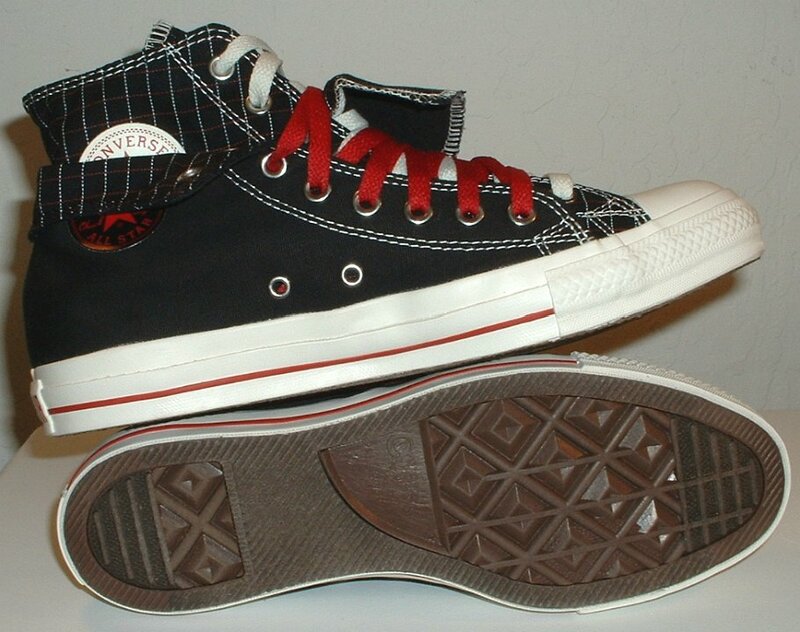 38 Black and Red Pinstripe Double Upper High Top Chucks Inside patch and sole views of black, red, and milk double upper high tops, with the outer uppers rolled down. 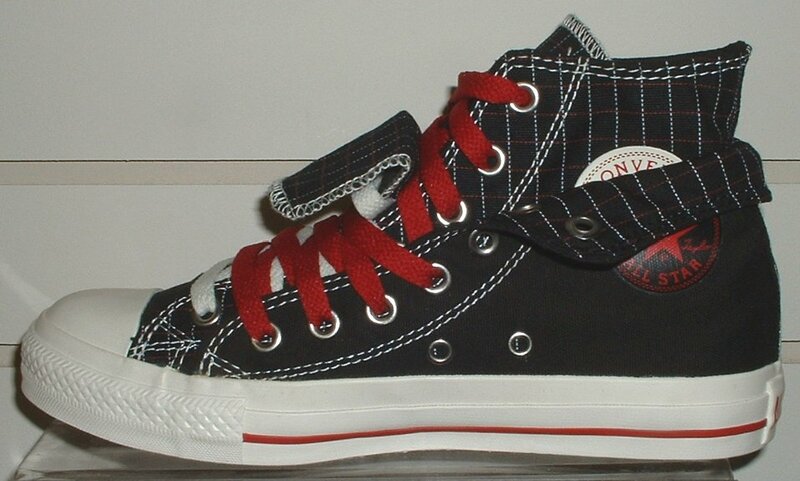 These high tops have black canvas outside uppers amd black pinstripe inner uppers. 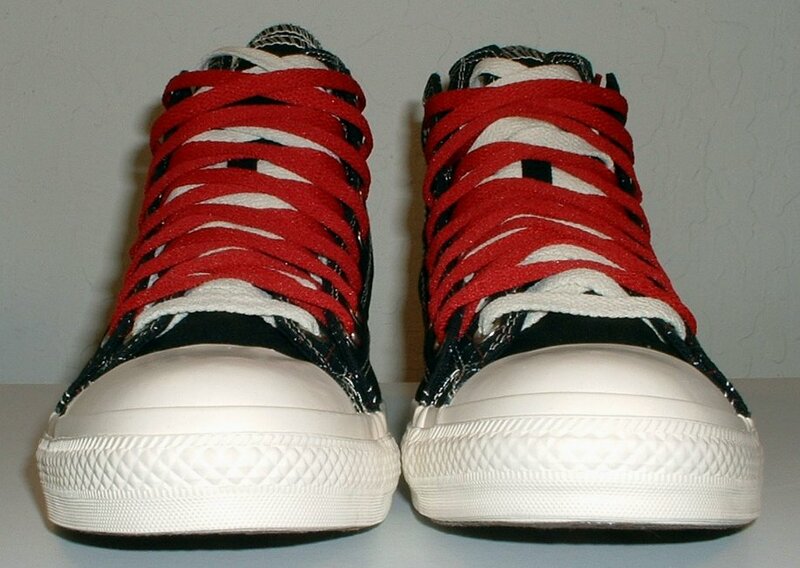 They come with red and parchment laces. 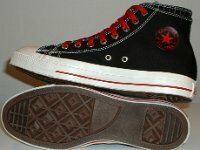 they also have double tongues with a notch in the top tongue. 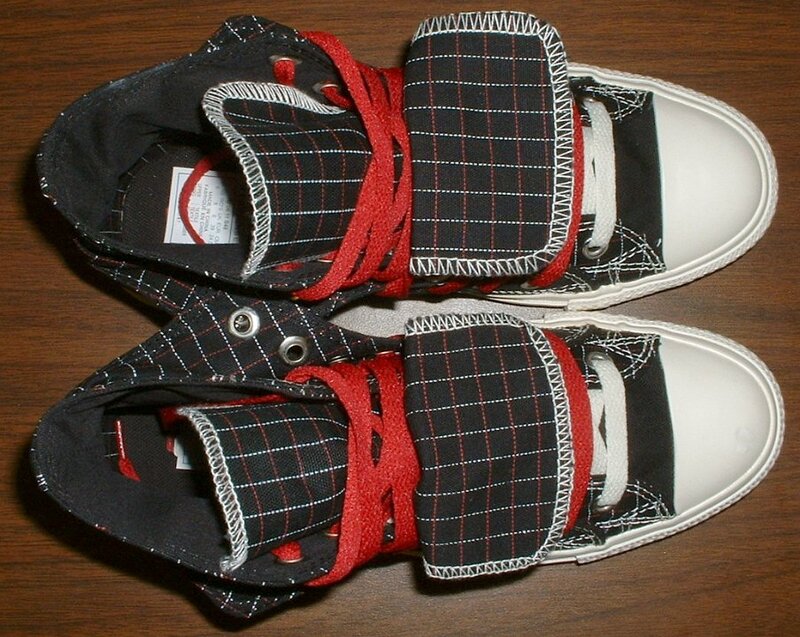 They have red piping (but only on the lower foxing) and a red and white heel patch. 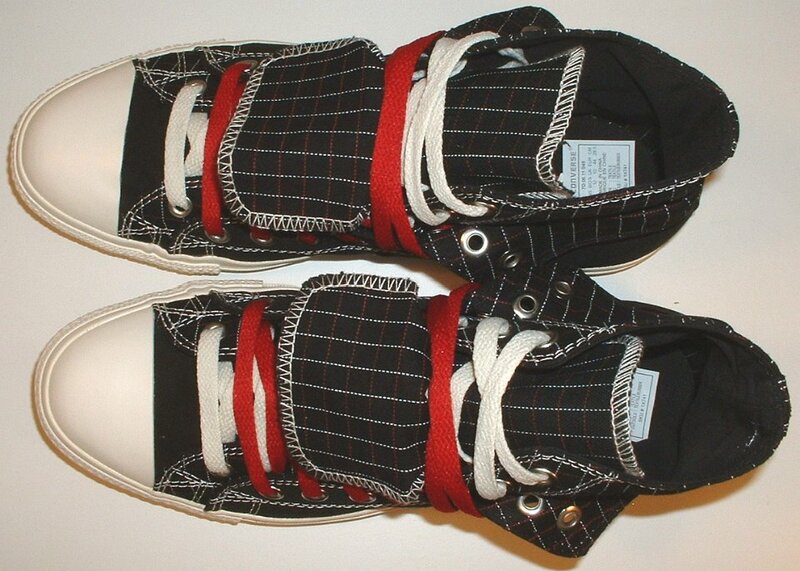 Ankle patches are in red and black, and red and white.